1. 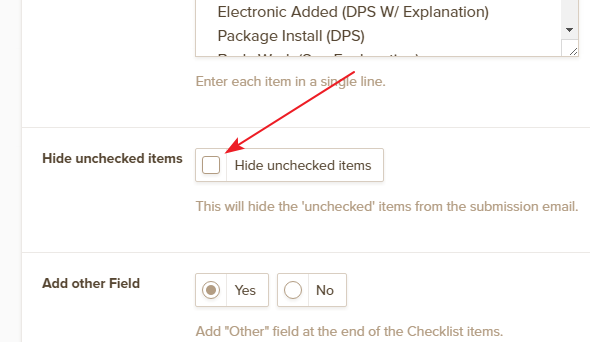 I am selecting the hide unchecked items field but its not working. The Check marks themselves wont print on IE or Chrome. I've tried cloning your JotForm to my account and see that option Hide unchecked items is not selected in the widget. I've enabled the option in the widget and see that the unchecked items are not displaying in the notification email. Please check the widget setting once again and make sure that the option is selected. Please get back to us if the issue still persists. We will be happy to assist you further. The other question related to checks not displaying is moved to a separate thread and shall be answered there shortly.